More players took up the hunting mantle this year than had ever before thanks to some meticulous tweaking to the Monster Hunter formula. If you’re going to make an RPG, you need to respect the grind. You need to integrate it into your game in such a way as to never make it feel like an overwhelming chore. A game where the grind never feels like the grind is the ideal state for a role-playing game to exist within. Monster Hunter: World did just that on so many levels when it launched back in January of 2018 and it’s been keeping fans both old and new enthralled since then. The Monster Hunter series has always had a very dedicated cult fanbase, but many of its more tedious mechanics were a turn-off to larger mainstream audiences. When it came to Monster Hunter World, some sort of magical balance between challenge and accessibility was struck. Crafting and cooking systems were streamlined as were the hunts themselves. Sprites that could help players track down their prey helped players from getting lost in the massive, sprawling, and varies landscapes of World. And then there’s the real meat of the game, the monster hunting itself. As players fought creatures both big and small for resources or progression they could learn more and more about them and develop more complex strategies. Figuring out a creatures routines, weaknesses, and the right spots to attack to get the resources you needed would slowly turn novices into seasoned hunters. The game also had an impressive selection of weapons to choose from each with its own unique skills, timing, and strategies. As players progressed the ante was raised and creatures would get bigger and tougher in tandem with their own hunter’s increasing skills. Even now when most players are well into the endgame Capcom is continuing to release new beasts and challenges for players to face down and earn new weapons, armor, and cosmetic outfits. 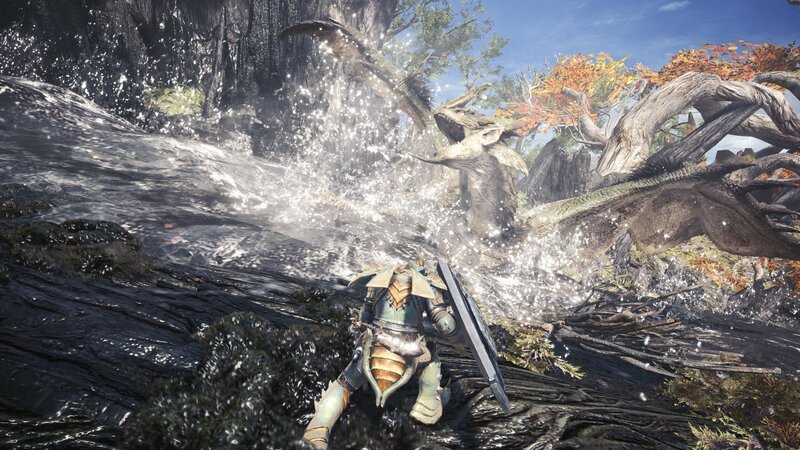 Capcom’s unrelenting support for Monster Hunter: World made sure that players would always have a new challenge to conquer and kept them coming back for more. By embracing the never-ending grind towards higher levels, new battles, and new equipment to be forged they made it disappear and fans were left with one of most enthralling RPG experiences to ever grace PC and home consoles. The fact that there's even more Monster Hunter: World planned for 2019 is just icing on the cake. In case you missed it, Capcom won The Shacknews Award for Best Comeback of 2018. Didn't Octopath come out this year too? Yeah, as far as RPGs go Monster Hunter really isn't one of them, at least not what people think about when they think of RPGs. I think we are going to add some categories next year to better represent how many different kinds of RPGs there are. Yeah, it's rough since the essence of what an RPG was has been diffused into practically every game category now. Oooh and I just got this for Xbox. Some of us tried to argue for others, but alas it was not to be. Respect the shack, this is just no. Pillars 2 blew this away. Monster Hunter IS NOT A Role Playing Game! Okay I've played a couple of hours now. Why is this not an rpg? It has every aspect of an rpg. It's an action game that only contains RPG elements in the gear side of things. So what differentiates FFXV from Monster Hunter then? Is this like an MMO? Did DQ11 win best action game instead? Dragon Quest 11 laughs at your choice. Damnit, I'm supposed to wait for Geralt to buy this game but it looks like so much fun and a more casual style that I could use right now.